1 Obituary for Dorothy Sanders (unknown newspaper), mother of Bernard. 2 Obituary for Elias Sanders (unknown newspaper), father of Bernard. 3 Jewish Telegraphic Agency, "Bernie Sanders’ ancestral town in Poland kvells over his Iowa performance", (accessed 02/12/2016). 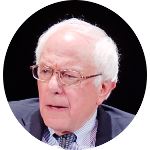 4 Wikipedia, "Bernie Sanders", (accessed 02/12/2016).